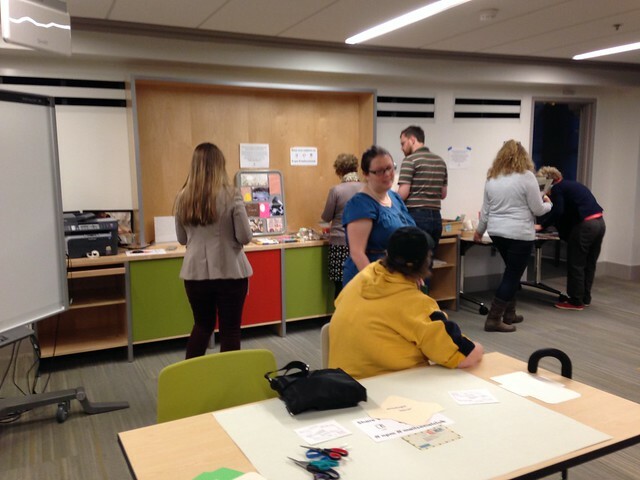 I celebrated World Post Day at the National Postal Museum with their fabulous Mail Social Club, coordinated by Melissa of Craftgasm. It was one heck of an awesome way to celebrate World Post Day, and I found myself wondering, why haven't I been to one of these before?!? Circumstances in my life conspired against me, but the event is now monthly, and I am sure this was only the first of many I shall attend. Then, the real fun began! 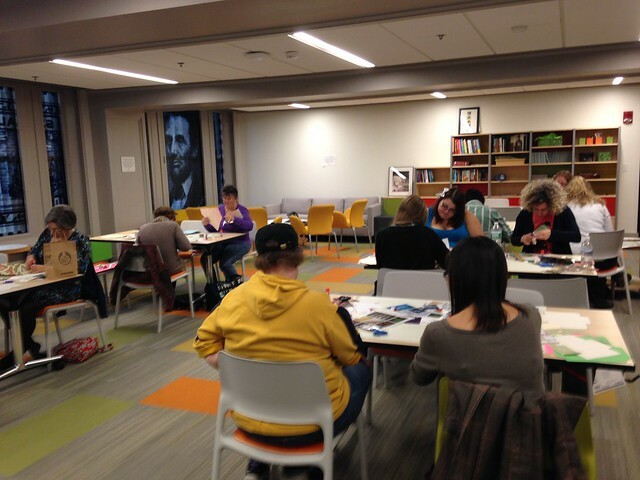 We headed to a lovely education space upstairs, which was a phenomenal workspace for our mail social. The theme of the evening was envelope making, and every table had scissors and envelope templates already set up, including the fabulous 2014 postal rates graphic by Donovan of the LWA. 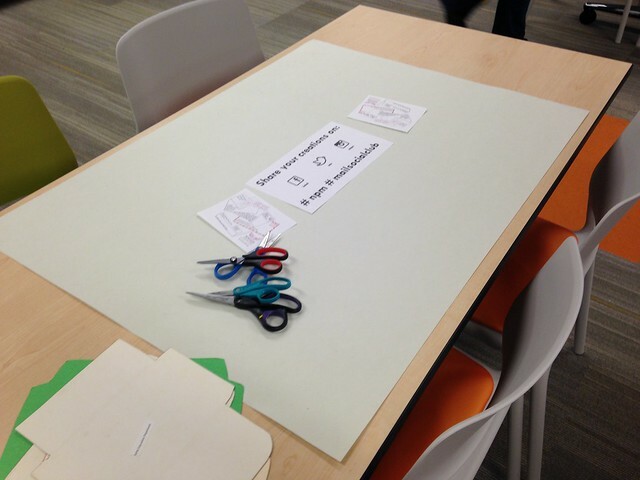 The event was held in a private room, part of the Byrne Education Loft. Here you can see the front of the room. Not the greatest photo, I know, but you can sort of get the idea. What you can't see is all the AMAZING FREE MATERIALS that were provided! I knew I would love any mail social, and that it would be a grand event, but I had no idea how very generous Melissa and The National Postal Museum would be. Not only did they provide scissors, envelope templates, glue sticks, and all kinds of awesome envelope-making paper, but they also provided washi tape, used stamps and other embellishments, pens and pencils - more than everything you'd need to make gorgeous envelopes. You could have arrived completely empty-handed and still come away with awesome goodies. Thank you, Melissa and the Postal Museum, for your generosity! 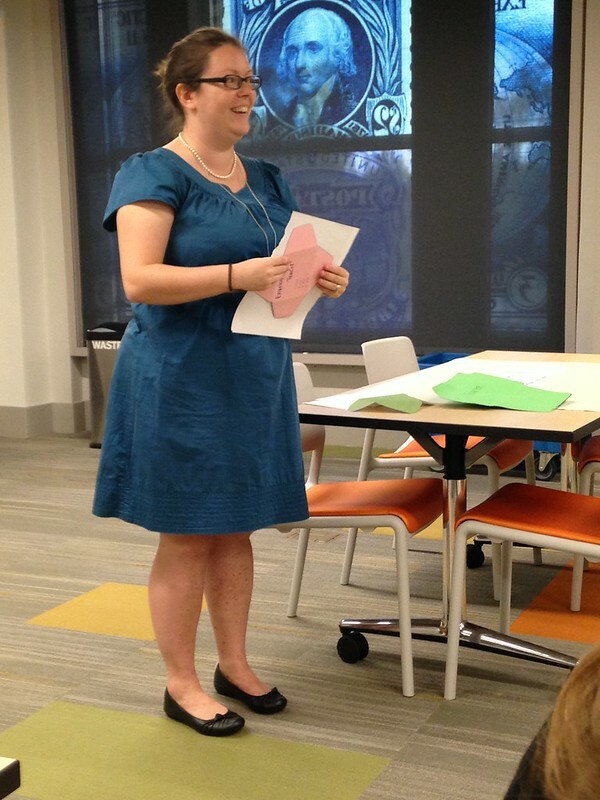 Here is Melissa teaching us how to make envelopes. Check out the very awesome George Washington stamp design on the window behind her! Yes, this is a place for mail geeks to get all nerd-tastic over details such as these. Above, my table at work. 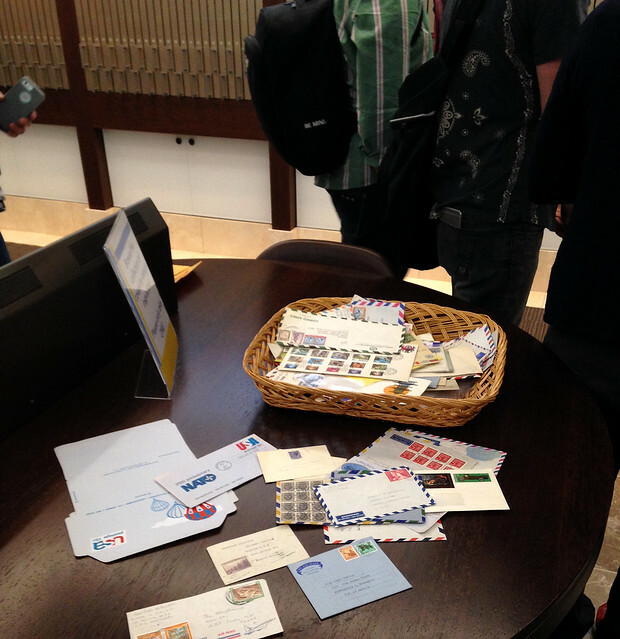 Another amazing benefit: meeting other mail geeks, some of whom were already pen pals! I got to meet and share a table with Allison of OMG Crafties and Mary of Uncustomary Art. I am good with candids and casual background photos but very bad with engineering poses, so I'm sorry I don't get to share their smiling lovely faces with you (d'oh! We all should have posed for a photo together! Damn my shy social introversion...), but sharing a table and mail-making with them was beyond fabulous. Mary and Allison were veterans of the Mail Social Club scene, and they knew to bring a lovely array of supplies. Mary also wrote lots of mail while there, which I thought was a pretty neat trick. You don't have to participate in the planned activity, you can just do your own mail thing. I'll have to keep this in mind as it's now getting into the season for people to make (and freak out about) holiday cards, and, well... y'all know how I feel about that scene. But now I know I can just participate in mail camaraderie and ignore the holiday hubbub when the time comes. 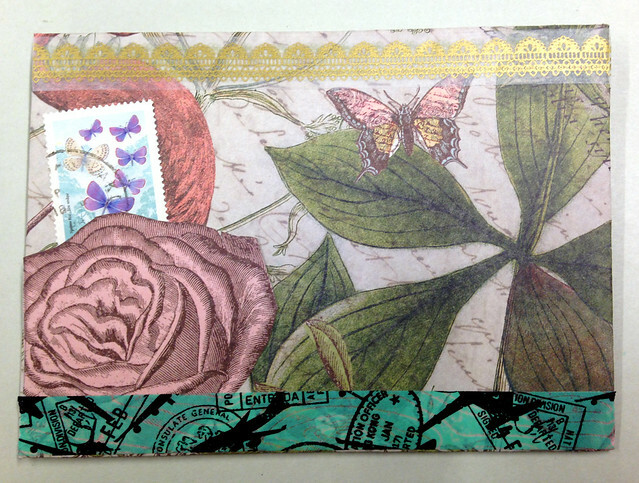 Here's one of the envelopes I made at the event. I'd like to note that all these materials - envelope paper, glue stick, washi tape, Canadian butterfly stamp embellishment - were provided at the event! I had to leave a bit early and unfortunately couldn't stay for the whole event, but on my way out I snapped this photo of the stamp gallery, alone and quiet at night, with the reflection of the neon "Celebrate" stamp sign. 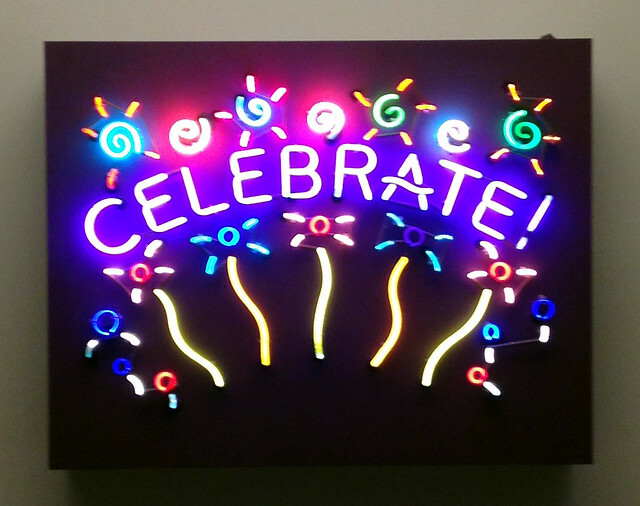 It was certainly a cause for celebration. Finally, here's my haul from the event. I was able to get there a bit early and just make it to the post office (within the Postal Museum, of course!) 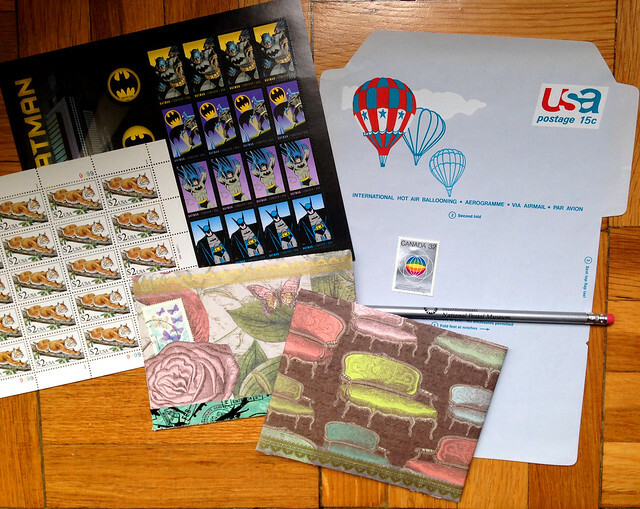 before it closed, and not only was it World Post Day, but it was also the date of release for the brand-new Batman stamps, so even though I pre-ordered them online, I bought myself a couple of sheets right there. (Good thing, too - my pre-order still hasn't arrived yet.) I also picked up these fabulous $2 bobcat stamps, which I'd not seen before, and thought were too awesome to pass up. So, the final verdict -- the Mail Social Club was utterly marvelous! I am already excited to attend another one. 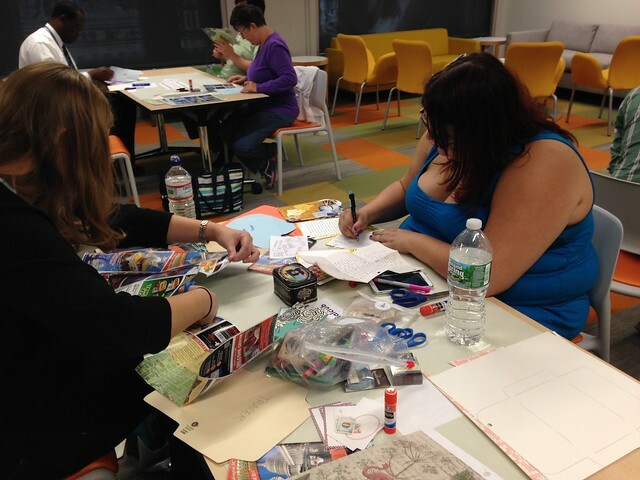 Mark your calendars: the next Mail Social Club is on Thursday, November 13! Thanks, Mary -- so great to meet you, too! And I know, wasn't that a great photo of Melissa? I snapped a bunch until I was sure I got one with her lovely smile. Melissa, you were so right. I knew I'd love it, too, i just didn't realize how much! Thanks so much for all your work to organize and run these amazing events. This is excellent! 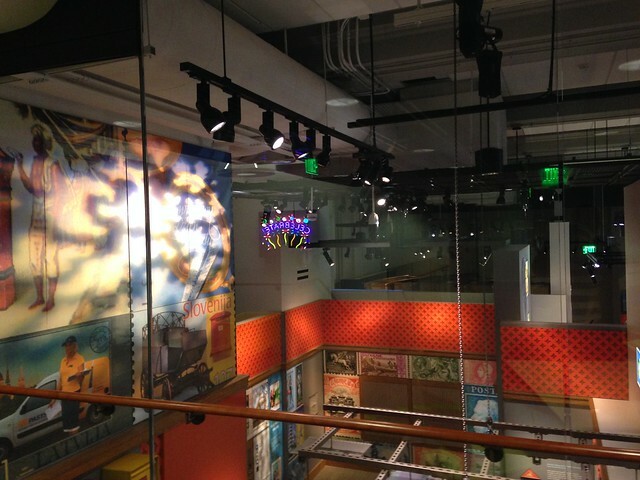 What a cool thing for the postal museum to do. Those vintage aerograms are nice - I used to use that form of overseas communication until the late 90s when email took over. I don't think the PO even sells them anymore ? I'd really like to send you mail occasionally - but I don't have your address... I know you are pretty much full up with pen pals, post crossing etc - this isn't about reciprocation, there are just times when I have an envelope or piece of mail art and think it would be perfect for you. Thanks so much, FinnBadger. You're right, the postal service stopped making aerograms in the 1990s. As for mail: send me an email at missivemaven -at- gmail. I do not give out my address publicly (i.e. on this blog). This visit to the museum,mail-geek friends,free supplies,Batman stamps........so jealous! Oh what fun. And there's Melissa and Mary! I just got mail from both of them the past couple days. If I were closer, you can bet I wouldn't miss out on these socials. Enjoy!! I love that rose design, so colorful. I would have enjoyed this event, too!